Clear illustrations can effectively educate people about data flow and data connections in a step-by-step way. A problem for products that process data is how they should leverage this information, how they explain the consequences of sharing this data, and how they get the suitable level of consent from people. This is especially important in the case of Oink, whose focus is on a younger audience. It's crucial to provide people with a sufficient level of information about the service, a clear understanding of the consequences, and to give them freedom to tailor their level of sharing. Step 3 - Oink visualises the relationship between the third party and the person with Oink in the middle, to help explain that, 'Companies will give Oink offers which we pass on if we think they will suit you.' Oink plays a role to ensure people's data is secure and only the best offers reach their customers. 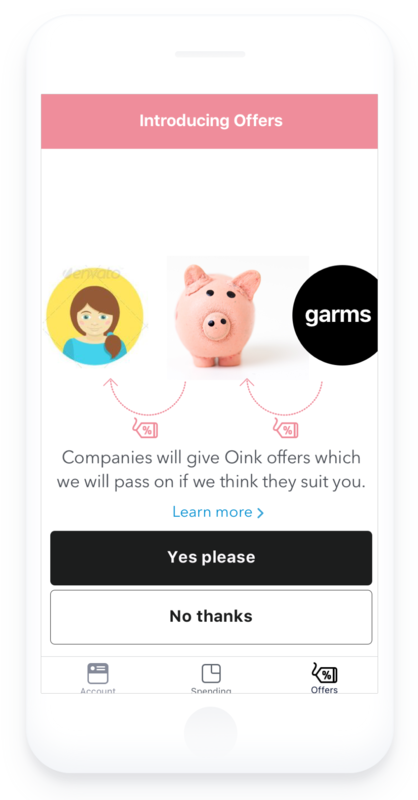 After selecting 'Yes, Please' to Offers, Oink gives people the ability to see which brands are interested in them. They can choose to engage with them, block them or snooze for a given period of time. This gives people flexibility and control over how brands can engage with them, and tailor the experience to make it more relevant to them. This is particularly relevant to young people, who have clear relationships with brands at different stages in their lives, and these relationships change over time. Explore further the snooze functionality when it comes to giving consent? Consider controls where consent is not just a binary yes/no question that will remain unchanged, but something fluid and changing over time. Explore time-based consent - how long to give it for, and when to prompt asking for it again?